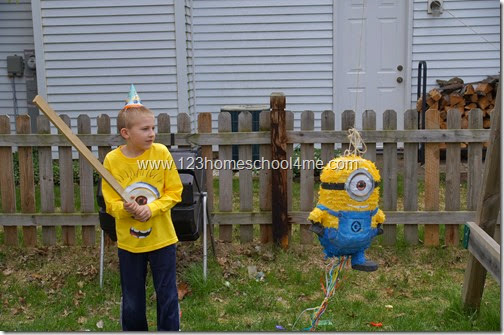 This year my son decided he wanted to have a Despicable Me Birthday Party. It was such a fun Minion theme I thought I’d share it with you guys. I can’t believe my baby is 9 years old! This may be a year old, but with the Minion movie coming out kids everywhere are going to want a super cool Despicable Me birthday party! 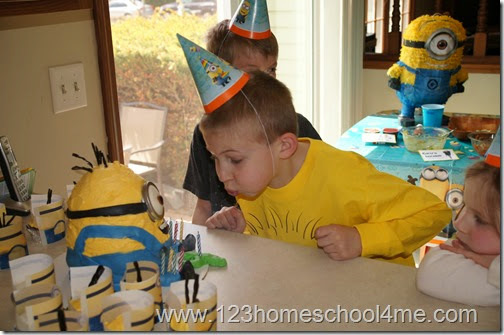 Take a peak at our fun Minion games, minion cake, and minion activities. 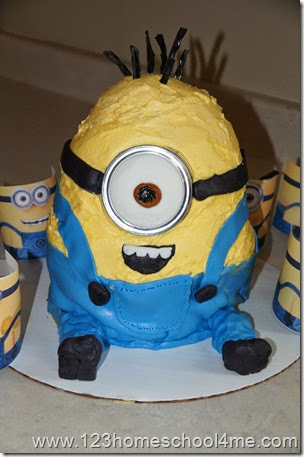 Here is my labor of love – the Minion Birthday Cake! I decorated it with my homemade buttercream frosting and marshmallow fondant. 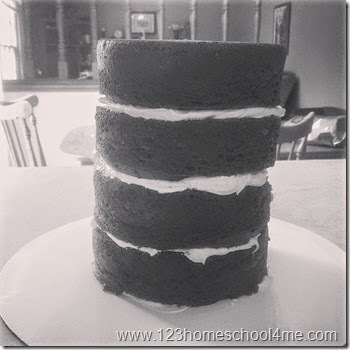 Note: If you do make this, try just 3 layers plus the 1/2 soccer ball and make sure your layers of cake are flat across the top before you stack them up! I stuck the 9 candles in the marshmallow fondant legs. Goofy loved his birthday cake! 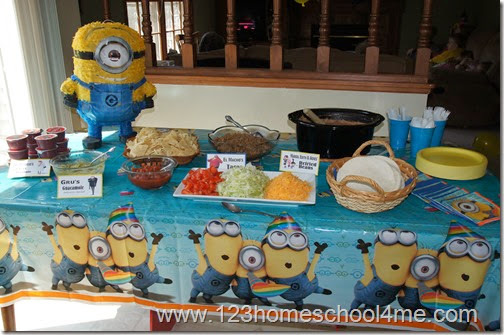 We mainly focused on games and activities from Despicable Me 2. So of course to eat we had to have Tacos! 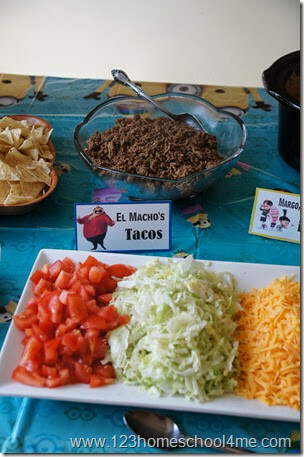 That tacos were a big hit with the kids and adults alike! We had El Macho’s Tacos complete with all the fixings like tomatoes, lettuce, and sour cream. 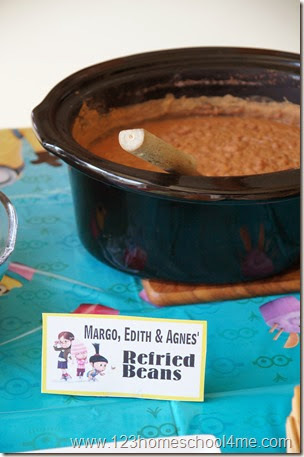 Margo, Edith & Agne made Refried Beans – these were made from scratch completely in my slow cooker. 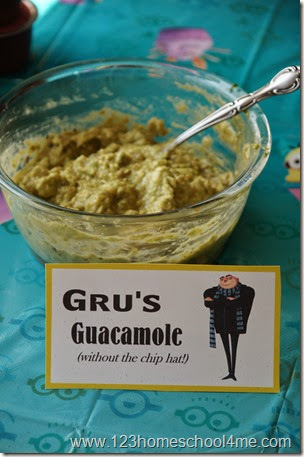 We couldn’t resist having Gru’s Guacamole (although I ran out of time to attempt the chip hat!). 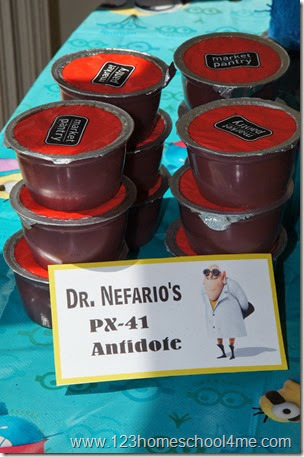 For a fun, fruit side dish we added Dr. Nefario’s PX-41 Antidote which was really raspberry applesauce. To drink we had Minion-Ade. I put out plastic cups with a sharpie so people could find their drink again instead of getting a new one. I made it simple this time and just used Country Time Lemonade’s instant Lemonade Mix – it made 4 pitches which was just right for our group of 22 guests. 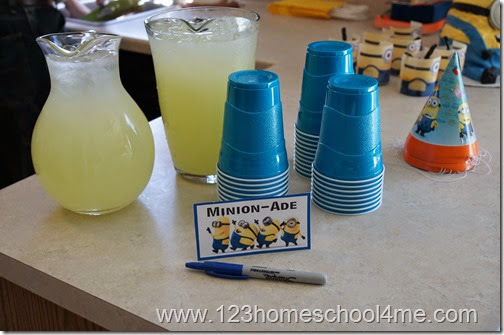 We played several fun Minion themed games with the kids at the party. This was a super easy game to set-up. I printed off images of “”bad guys” from the two Despicable Me Movies – Vector, Evil Minion, and El Macho. 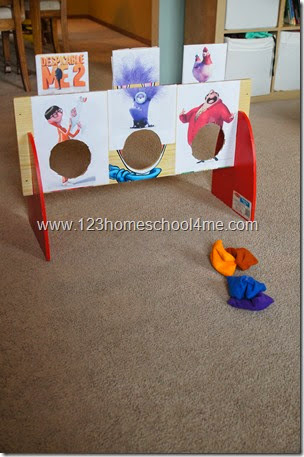 Then I tapped them on a Melissa & Doug bean bag toss game we already had, cut out holes in the middle and TADA! The kids loves it. This game was the kids favorite. I printed out and laminated pictures of minions – 1 per kid. Then we hung them up in the backyard (and had to do extra securing as our party day turned out to be very windy!) El Macho (Daddy) came by and made all the Minions evil by painting them with watery purple paint. The kids than used their water guns to return their minion to normal. The kids loved this so much we did it several times. 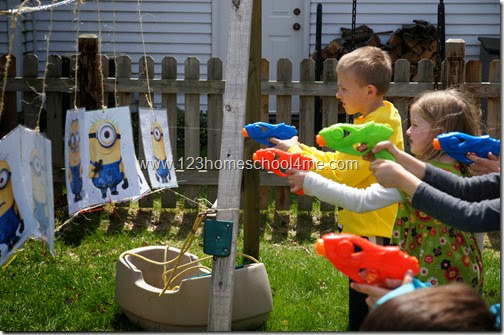 Then the kids were told to wash the Minions with the remaining water so they could take their water guns home with them. One of the reasons Goofy decided on a Minion birthday party was because we spotted this adorable Minion Piñata at Wal-Mart. It really was super cute. We filled it with a limited number of candy plus raisins, fruit snacks, stickers, minion bouncy balls, whistles, glow in the dark eggs, jumping frogs, and more. The kids were told they were to pick up one of each – that way no one got tons with some kids getting left out. Sorry, no picture of this game, but it was super fun and easy to do. In Despicable Me 2 Lucy had a Lipstick Tazer she uses on Gru. So we played that when the person who was it got near you you can yell out Lipstick Tazer, shake your limbs, and be frozen until a friend came and untagged you. The kids thought it was great fun and it took just the right amount of time until the parents returned. I can’t believe I didn’t get a picture of all the Minion Balloons we made – ugh! We made 50 yellow ballons with these FREE printable Minion goggles & eyes. They decorated the ceiling, walls,and floor around the party area. It really added to the fun!